Amy Lowell’s larger-than-life personality often overshadowed her writing and collecting. Lowell’s collection will be showcased in “From Austen to Zola: Amy Lowell as a Collector” at the Houghton Library beginning Sept. 4. Amy Lowell — a controversial, cigar-smoking, outspoken, Pulitzer Prize-winning poet — collected works by prominent creative artists such as Jane Austen, Ludwig von Beethoven, William Blake, Charlotte Brontë, John Keats, Michelangelo, Walt Whitman, and Émile Zola. Works from Lowell’s collection are showcased in “From Austen to Zola: Amy Lowell as a Collector,” Houghton Library’s fall exhibition. This exhibit opens on Sept. 4 and will run through Jan. 12, 2013. Lowell was one of the few women competing in the male-dominated world of collecting. She began at age 17 by purchasing Sir Walter Scott’s “Waverly” novels with her Christmas money. Thanks to her inheritance and her income as a poet, critic, and lecturer, Lowell continued collecting throughout her life. The exhibition includes a beautifully hand-colored copy of Edward Young’s “Night Thoughts,” with illustrations by William Blake; Blake’s “Songs of Innocence”; and his engravings for an edition of Dante. Other artistic gems include a sketch by Michelangelo on the back of a work order (1523) and the delicately colored woodblock prints of Hokusai’s “Kachō gaden” [Drawings of birds and flowers] (1848). Literary women were another, and natural, collecting interest. The exhibition includes a letter from Jane Austen to her sister Cassandra, six miniature storybooks written by the 13-year-old Charlotte Brontë, the manuscript notebook “quarry” from which George Eliot mined characters and events to write “Middlemarch,” manuscript poems by Emily Dickinson, and more. And there is Lowell’s Keats collection. In its day it was the most important single collection of Keats autograph material in private hands and now forms the center of the Harvard Keats Collection, which is the largest collection of original Keats material in the world. Lowell, a romantic (and a Romantic) at heart, was particularly interested in rehabilitating Keats’ relationship with Fanny Brawne. The first Keats letter she purchased, in 1902, was a love letter from Keats to Brawne. Lowell later purchased other love letters, the volume of his “Poems” Keats gave Brawne, and a lock of Brawne’s hair. The working manuscript of “To Autumn,” Shelley’s letter inviting Keats to visit him in Italy, and the manuscript of Shelley’s “A Proposal for Putting Reform to the Vote,” also included in the exhibition, show how Lowell’s interest in Keats, which culminated in the two-volume biography of Keats she published shortly before her death, grew from collecting him into developing a research collection to support her writing. Other themes in Lowell’s collecting are highlighted in the exhibit, including her focus on “association books” (books owned and often annotated by famous authors), including volumes belonging to Gibbon, Robert Browning, Charles I, and the Empress Josephine; and on autographs and manuscripts, including a passionate letter from Lord Nelson to Lady Hamilton, and manuscript poetry by Ben Jonson, Whitman, and Coleridge, and a manuscript essay by Thoreau. French literature was another passion, and Lowell collected manuscripts by La Fontaine, Voltaire, and Verlaine, as well as books presented by Flaubert, Mallarmé, and Zola to friends. The exhibition concludes with a look at Lowell’s collecting of her own contemporaries, such as Thomas Hardy, Ezra Pound, T.S. Eliot, and D.H. Lawrence. From October through January, a companion exhibition, “Six Decades of Treasure Hunting: Purchases with the Amy Lowell Fund,” will be in the Amy Lowell Room at Houghton, focusing on the important library acquisitions made possible by the funds bequeathed by Lowell to further develop the Harvard collections. 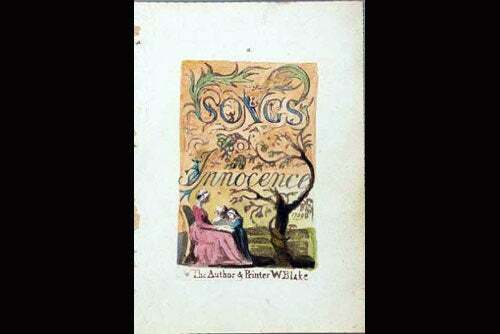 Included in Lowell’s collection is William Blake’s “Songs of Innocence,” 1789. The title page is shown. Utilizing materials gathered from 25 years of working at the Harvard Herbaria, Susan Hardy Brown's art reveals and transforms the ephemera associated with her daily work in the exhibit “Ex Herbario: Recent Works by Susan Hardy Brown,” on view now. This work is titled "Blue Queen-Anne's Lace."